In my absence for over a month on this blog (yikes!) I have been drinking very well thanks (not that you were asking). 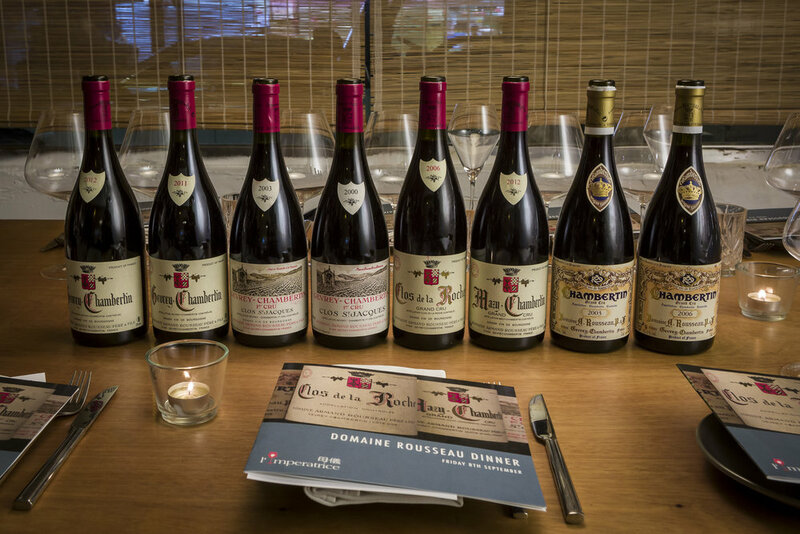 One of these momentous occasions was this Rousseau Dinner last month at Serge et le Phoque. Domaine Armand Rousseau is one of those legendary domaines that you are always keen to try (and for sure know that you would LOVE) but never have the budget to really go for it. This time I tasted the Gevrey Chambertin village, the famous premier cru "Clos St. Jacques", Mazy Chambertin, Clos de La Roche and of course the mighty Chambertin. In terms of domaine news, Eric is slowly handing the reins over to his daughter Cyrielle, who is continuing her father's well established practices. One of the most significant changes she has made (at least to consumers) is that she took a 25% hike in pricing. It sounds like a massive difference—one that everyone feels down the supply chain—but it makes sense considering the Rousseau has been underpriced for a long time upon release. This more recent change brings it in line with domaines of similar prestige and stature and arguably at an even better level of wine-making. I have long been a huge fan of Clos St. Jacques, which is a very approachable lieu-dit for Burg rookies like me. It has depth, structure and pronounced notes that make it so easy to love. My favourite version previously has been from Sylvie Esmonin, which I am surprised to find now that is is the parcel that is furthest away from Rousseau's legendary one. Thanks to extremely clear pic from Steen Öhman, who is by the way godsend when you are trying to find more info on individual parcels or in depth history of any sites (sorry Jasper Morris but you're too brief! ), you can see how the almost 1er cru is divided amongst domaines. Interestingly enough the 1er cru only did not become a grand cru was because the previous single owner, Comte de Moucheron, was a royalist and defied the new classifications under the new Republic government. The Comte's land was sold to Rousseau, Fourrier, Esmonin and Claire-Dau and Claire Dau further split and was sold to Jadot and Bruno Clair to the present day holdings as you see above. As an ardent and vocal fan of Clos St. Jacques, I was well taken back by how much I enjoyed the Chambertin. This seems like a no brainer as Chambertin is ultimately the flagship wine of the estate but I truly had thought my previous experience with this lieu-dits will lead me right back to it. Rousseau's Clos St. Jacques as compared to Esmonin was much more vibrant, powerful and structured, with intense fruit and peppery notes that almost reminded me of well aged Northern Rhone syrah. The taste has redefined the expressiveness, range and capability of the pinot grape to a whole different level. The Chambertin on the other hand had the same intensity, structure and power however the peppery notes were more nuanced, giving it a sense of finesse and elegance that edged it above the Clos St. Jacques. Although the Mazy and Clos de La Roche were slightly overshadowed by the adoration and attention paid to the Clos St. Jacques and Chambertin, they were both fine well-drinking beautiful wines in their own right. This dinner proved that in spite of the price hike, Rousseau is very much a domaine worth the time and money to seek out.